You probably know that mobile devices are blowing up today unless you were hiding under the rock for the last decade. It means that website owners are forced to improve their users’ experience when logging on to a site through the smartphone or tablet. Such devices feature smaller screen sizes. It means that displaying the same website layout as on users’ desktop looks at least inefficient. Modern website builders show their recognition of current mobile trends offering ready-to-use mobile-friendly templates. They provide a better online surfing experience to visitors who prefer tablets and smartphones to their PCs. The idea is to automatically rearrange all website content compressing it into an informational stripe that is easy to scroll down. Up-to-date website building software appears to be a great space saver making it easier for a user to browse pages with just several touches. However, this research is for those who already have website builders and are eager to build its mobile version. We have got used to creating websites with website builders from scratch by selecting a platform based on a certain task, budget, skills and using the tools it offers to launch a site. This is a normal approach, from our point of view. There are also other approaches you should be aware of. For example, you can design only a mobile version of a ready made website with DudaMobile. The web abounds in multiple cool websites that were launched in those times, when no one even heard about responsive design – just like about smartphones or tablets. There are also many fresh projects, which have become successful, but haven’t managed to get a mobile version yet. Probably, web developers decided not to bother about this nuance just because they did not believe in the success of this endeavour. Finally, lack of budget could be the reason for the absence of a website mobile version and it was quite hard to find time to get the one later. How to See the Mobile Version of Your Website? Most website builders make it easy to view how the content will look like on mobile devices. The feature is available on the stage of website building and editing – it often looks like an icon of a smartphone. It means that you can customize the website before it is published. Some more advanced software like Wix delivers a selection of automatically mobile-optimized templates. It means that you are not going to perform any actions to optimize your content on your own. The platform will do everything for you. Moreover, you can benefit from an intuitive Wix Mobile Editor interface in case you need to make any edits to the website’s mobile version. The instrument lets you change colors, styles and background: it is not just removing navigation menu bar and compressing content. The mobile editor is a full-scale tool to customize and optimize your website making it 100% mobile-friendly. DudaMobile is a specialized mobile website builder that can be effectively used to create a correct and well-designed separate mobile version for your website for any website type. In fact it is a website-to-mobile converter. Building a mobile website in DudaMobile is a challenging approach, but it pays its way when working with serious projects: you pay more attention to details, distinctions for greater convenience of the mobile version as compared to the desktop variant, extra functional blocks or, on the contrary, you just decide to remove all the extra elements. Read more about DudaMoblie in my in-depth review. To start working with the platform, you need to enter the address of a website that requires a mobile version. The system will think for a while and then it will redirect you to the website editor. The preview window in the mobile device format will appear to the right. The options categories needed to transform the design of the website will be provided to the left, while the choice of the available options and minor settings will be accessible in the middle of the page. Layout, where you can select website structure to present the materials. There are 5 variants available here. It is also possible to set up the style for a menu block. Header, which offers a choice of a header type (text or image), size of this section, alignment, background and opportunity to reposition fixed block header during web page scrolling. 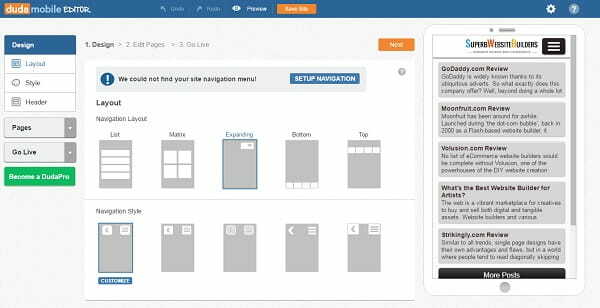 “Pages” is a section, where you can edit each static website page. This is where you can set up SEO, choose individual template, set up opening terms, link, add your own code and more. What’s interesting, you can add widgets – different content and functionality elements – to a web page. All of them are subdivided into 3 categories, namely business, design, social. There are 40 widgets here. Some of them include callback option, restaurant menu, gallery, 2 columns, map, coupon, list, tabs, HTML code, button, abstract (text), “like” and “share” blocks, RSS. “Preview and Publication” is a section, where the links to the ready made result and comparison with the initial version are located. This is where you can also find a plan payment offer to publish the mobile version of your website. What benefits can you avail when using this service? Let’s find that out now. You have a website without a mobile version. You launch DudaMobile, enter a link and the system starts scanning your website structure and its materials. This is further converted and adjusted to fit mobile resolutions on the code level. You get your website pages with all the content, but now they perfectly fit the screens of mobile devices. As soon as you are done with the first step, you can improve your website design and functionality by using design editing options and a rich set of widgets. They can be integrated into any part of a web page. 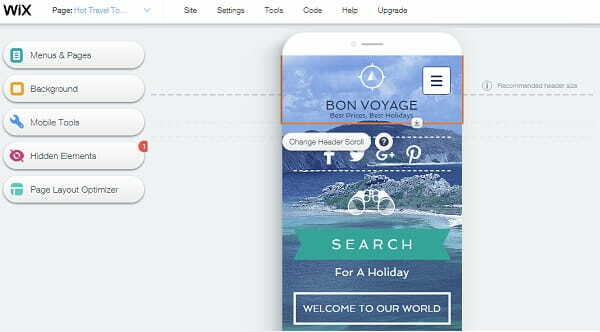 Thus, the process of building a mobile template in DudaMobile implies the use of classic tools of a WYSIWYG website builder, allowing users to expand the website functionality. Each widget comes with settings that fit the context of the assignment: for example, design, background, links, field names, spaces, code insertion etc. Generally, the customization of the built-in elements is on a decent level. Finally, we get a converter of mobile websites combined with the functionality of a website builder. It features simple interface, adequate amount of options and nice outcome. How Much Does a Website Mobile Version Cost? Let’s proceed to the most important part now. As far as we don’t talk about creating a website from scratch and deal with the optimization of a ready made website for a mobile device, then the cost should be low. However, that’s not quite right. The cost to make a website mobile friendly can be compared to that of a ready made website created with a medium-class website builder. Wix and uKit, by the way, allow building a website for a more affordable cost and this website will be mobile-friendly right from the start. What’s the sense of using DudaMobile then? For $159 you will get a mobile website forever without the need to prolong DudaMobile services. You can either make a one-time annual payment ($60) or choose to make monthly payments ($6) as well. What does this cost include? This allows adapting any of your profitable old websites to a modern market environment. Mobile traffic is a tempting perspective, which has already overwhelmed the desktop version traffic. Simple approach and apparent profit from using DudaMobile is worth the investment. DudaMobile is a useful service, which pays much attention to the mobile-readiness of websites created with it. The functionality needed to convert an ordinary website into a mobile one is charged separately here. You can make any website mobile-friendly with its help. This means that the full version of your website remains unchanged, but users will see its variant, which is optimized for their mobile devices. This is the way the system works. The cost of using the service may seem somewhat expensive, but that’s not so. The thing is that websites that don’t have responsive design or a separate mobile version yet, are, probably, quite old. Consequently, they may have decent traffic with loyal audience that doesn’t find it convenient to use the website options from their mobile devices. It’s, probably, impossible to find a web designer, who worked on the development of this website already. Another reason is that you haven’t yet decided to invest money or learn how to make your website mobile-friendly on your own. DudaMobile is a nice solution in this case. There is no coding here. Everything is simple and eventually looks decent. This is an easy way to boost the stability of your mobile traffic for $60/year or for $159 forever. You have, probably, ironically thought that the word “forever” will end up at the moment the platform disappears. Yes, that’s right. However, the system was founded in 2009 and lots of renowned clients use its services and succeed at this. So, you don’t have to be concerned about this nuance. It is possible to compare DudaMobile converter with the competitors, but there are no many of them in the niche. So, we recommend using the service to everyone, who keeps losing clients with a desktop website version. Try using it, the editor is free. You’ll see the quality of the service to decide whether it’s worth the investment. Home » Helpful Tips » How to Create a Mobile Version of Your Website?